Mingtown Etour International Youth Hostel v Shanghai, Čína: Zarezervujte nyní! 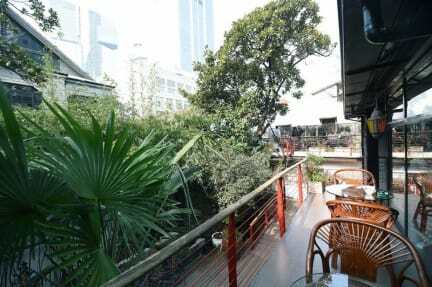 Hostelworld travellers say Mingtown Etour International Youth Hostel is 'in the very heart of Shanghai, [with] shops and places to hang out all around the hostel', 'very close to People's Square metro and Nanjing Road, [within] easy distance to French Concession'. Our guests frequently praise the comfortable, 'clean and well-maintained' rooms as well as the staff, who are 'nice, friendly and speak English well'. The onsite bar serves 'a good selection of European bottled beers'. We like their courtyard, which we're told is 'a great place to relax and look up into the skies'. We have a unique, natural atmosphere here. The bridge, running water, rockery and waterall make the whole hostel full of spirit. I really think the common area is the perfect fusion with nature. You can be here, where sunshine is your new clothing, green plants are your ornaments and the pool could be your crystal shoes. 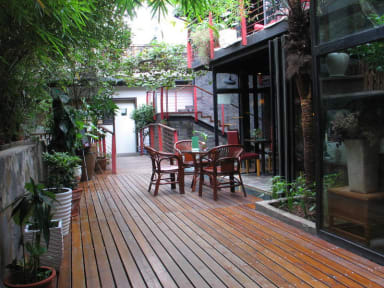 If you want to enjoy some quiet and comfortable time in the middle of this concrete jungle, our place is the ideal choice. Living in our hostel, you can do a lot: early in the morning, play Tai Chi on the balcony. At noon, enjoy a plate of delicious fried rice in our café. In the afternoon, enjoy a cup of delicious coffee slowly in the yard. In the evening, you can be drunk with a guitar and a case of beer until the next morning. I bet you've never enjoyed a hostel quite like that!